Beautiful Ponderosa Trees and Scrub Oak make this property extra desirable. With in walking distance to the Millstone Entrance for Fishing the Brazos River. Dual elevations for your building site choose from. Both are flat and very buildable. 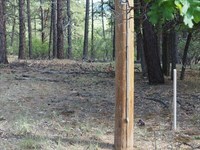 Private well and electric pole with transformer on the property. Easy access road to top elevation. Accessible year round. Front is lined with a beautiful split rail fence and two entrances. This is a must see property. A fantastic Building Site.